The Pre-Raphaelite Society AGM this year was followed by the Founder’s Day lecture, given by Professor Robert Hewison, writer, academic, critic and Ruskin expert. Like Ruskin, Professor Hewison has held the post of Slade Professor of Fine Art at Oxford, and his lecture for the Pre-Raphaelite Society was on ‘A New and Noble School in England’: Ruskin and the Pre-Raphaelites. Of course, Ruskin’s support for the PRB is well-known, but, as the lecture explained, it was not as straightforward an affair as one might imagine. 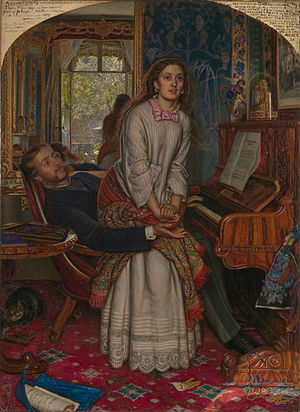 Hewison emphasised that Ruskin was not involved in the inception of the Brotherhood, nor directly responsible for inspiring them, though his books did prove significant, particularly for Holman Hunt, and Ruskin’s description of the typological symbolism of Tintoretto in Modern Painters may have been especially important. Given Ruskin’s passion for the work of Turner, the very different oeuvre of the PRB may seem an unlikely style to have touched him so strongly. Yet Turner did not welcome Ruskin’s promotion and interpretation of his work: with both the PRB and the Gothic Revival, however, Ruskin was able, as an established critic, to intervene, promote the work he saw as worthwhile, and steer them in a more Protestant direction. Moreover, he was not only in a position to help the PRB at a turning-point in the Brotherhood’s work, but als o offered financial patronage; Hewison suggests that what Ruskin gained from this was not only the altruistic ends of helping the Brotherhood, but, for himself, companionship. Ruskin’s 1851 pamphlet in support of Pre-Raphaelitism relates as much to the work of Turner as to that of the PRB, yet it draws a number of parallels. 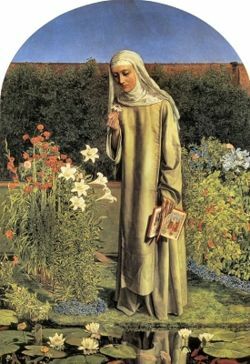 Hewison suggests that the PRB’s adherence to ‘facts’ – or ‘truth to nature’ – was particularly significant in the Brotherhood’s appeal for Ruskin; for example, though he may have deplored the evident Catholicism of Collinson’s painting ‘Convent Thoughts (above left), he also admired the botanical accuracy of the garden. What particularly struck me about Hewison’s lecture, however, was the parallels he drew between Turner and the PRB, especially Millais. While Turner’s paintings seem revolutionary and modern, representing nature in a way far distant from the PRB’s paintings, what the PRB did was also revolutionary (or ‘avant-garde’, as the Tate exhibition suggests): they depict not only the natural world in realistic style, but approach the modern world and its issues in a way at once relevant to the period and also eternal, unconfined by rules, time or society. What the PRB did, as Hewison demonstrated in a close reading of Hunt’s ‘The Awakening Conscience’, was not only to reproduce faithfully the world as they saw it, but to use a symbolic realism: a realism which relates to another world of ideas, embuing the world of nature and of Victorian society with an emotional dimension. It is this approach, combining a depiction of the natural world with a symbolic, emotional language, ‘reflecting a new, materialistic world view’, that offers the link between the PRB and Turner which Ruskin saw. Naturalism, such as can be seen in Brett and Inchbold, is therefore never enough, and Turner remained a ‘touchstone’ for the PRB and for Ruskin. I am always very ambivalent about Ruskin. I can see why Ruskin would not approve of Turner’s art or sexual activities, and therefore I can see why Turner did not welcome Ruskin’s promotion and interpretation of his work. 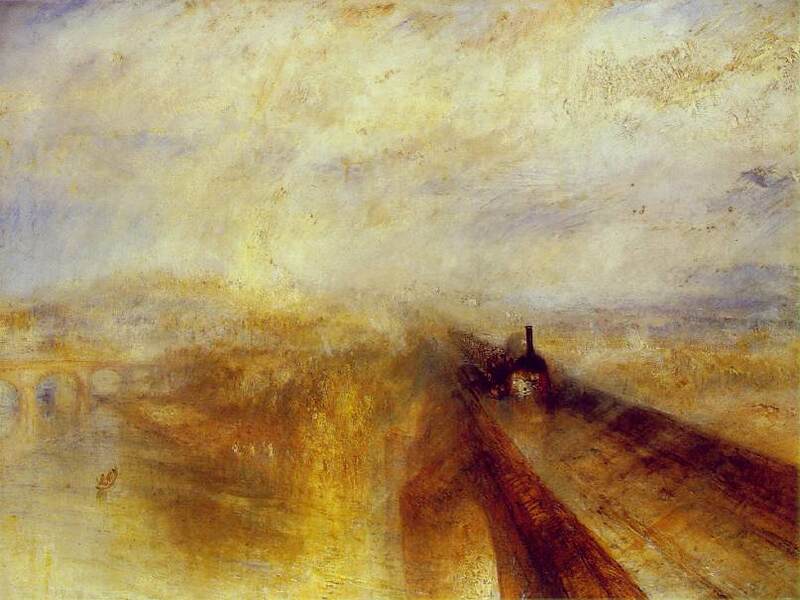 Especially since Turner was old and established, and Ruskin was young and unestablished. Unlucky Turner. But: the PRB and the Gothic Revival were different. Ruskin liked much of their art, he was older by then, more established and was prepared to put his considerable effort into promoting their careers. Lucky PRB! You’re right, and this was very much the gist of the lecture. But I think it’s a credit to Ruskin that he was such a passionate supporter of Turner’s art despite his own beliefs about the importance of morality. And he later changed his views on this subject, perhaps in part due to his discovery of some of Turner’s vices, writing to Elizabeth Barrett Browning that ‘nobody can be a great painter who isn’t rather wicked – in a noble sort of way’.